Filtration is essential to every aquarium for the removal of waste and other toxic elements that may be harmful to your fish and inhabitants. Without adequate filtration, it may be the difference between a thriving aquarium system and a failing one. Here we will explain the different types of filtration as well as the different types of filters you can buy. This is the process in which filtration media such as filter pads, filter bags, cotton, etc. trap solid debris such as uneaten food, fish waste, leaves, etc. in the water that is too large to pass through. Very like a strainer that allows water to pass through but capturing all the larger particles. This is the most basic form of filtration and the media to perform mechanical filtration comes in a variety of materials and types. The porosity of your mechanical filtration media controls the size of the solid debris it can trap. Coarser media will trap larger debris but will allow small pieces to pass through. Finer media will do a better job filtering but will clog faster and require frequent cleaning and refreshing. A great combination is having multiple media of different porosity. A coarser one first followed by a finer one. This method of filtration is one that we want to simulate as close to nature as possible. Biological Filtration is a natural process in which bacteria (beneficial bacteria) break down unwanted contaminants in the water such as ammonia, nitrite, nitrate, and other organics. The method of biological filtration or bio-filtration can be referred to the method of creating an environment or system where beneficial bacteria can colonize and grow in large quantities to carry out biological filtration. You aquarium will always be susceptible to harmful chemical pollutants via fish medications, tap water, byproducts of fish waste and uneaten foods. By the means of Chemical filtration, we can easily remove these pollutants that mechanical and biological filtration can not. Chemical filtration uses a variety of media that you add into your filter to remove the specific pollutant you want. For example, by adding activated carbon into your aquarium filter, you can remove a variety of pollutants ranging from copper, chlorine, medications, etc. If you need to remove ammonia, one might add zeolite into their filter system. NOTE: We recommend everyone having a filtration system that incorporates all three types of filtration. External Canister Filters are great for larger capacity tanks. 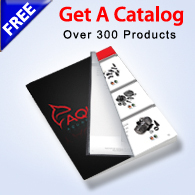 They provide superior filtration and can handle large heavily stocked aquariums. These filters will maximize its filtering by using its larger capacity tank as well as up to 5 beds of filtration media. The 5 beds allow for the option of adding biological and chemical filtration media. Some Canister filters even come with a built in UV sterilizer to promote even clearer water. Hang On Back / Waterfall Filters or often called "power filters" are one of the most popular types of aquarium filtration devices due to their versatility and ease of use. They simply hang on the back side of your aquarium with the suction end submerged. Draw in water through that end and returns via spout that simulates a waterfall. Helps oxygenate and circulate the water. Choose from a variety of sizes ranging from small mini applications of 5 gallon tanks to larger capacity applications up to 259 gallons. Internal Filters are small budget filtration systems that can pack a punch. 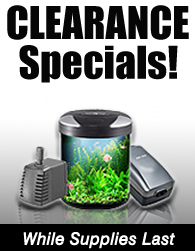 These simply get placed into the corner of your aquarium and certain models can handle up 396 gallons per hour. They may also serve as a great water circulator or a simple water pump. Protein Skimmers - Protein skimming is another form of chemical filtration. Many aquarists feel that a protein skimmer is an absolute necessity for marine aquarium systems, especially those that are heavily stocked. A protein skimmer is an excellent supplemental filtering device that works by creating tiny bubbles in a reaction chamber. These bubbles propel proteins in the water up to the surface of the reaction chamber. As the bubbles burst, they expel the proteins upward into a collection cup or discharge tube. Skimmers remove proteins before nitrifying bacteria break them down into nitrate. With less waste to process, the bacteria consume less oxygen. Higher oxygen levels and low nitrate levels mean better health for your aquarium inhabitants. Wet Dry Filters mix air with water, as the water trickles over an exposed filter media. Biological filtration and gas exchange occur as the water flows over the media surface. The rapid oxidation of ammonia and nitrite makes these filters extremely efficient; they are an outstanding choice for freshwater and saltwater aquariums. 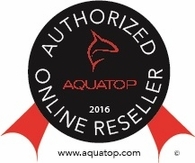 UV Sterilizers are great supplementary devices for both freshwater and saltwater aquariums. Used in conjunction with your primary filtration system, UV Sterilizers use a special fluorescent lamp that will eradicate and control these free-floating microorganisms as well as disease causing pathogens when water is pumped through the unit.